Offered is an unusual early American coin silver teaspoon circa 1820 bearing a crude mark of "PEABODY." in a rectangular punch. The maker's mark is slightly rubbed but still legible. This mark is attributed by William Voss (see the American Silversmiths website by googling "silversmiths" and "genealogy") to Nathaniel Prentice Peabody (1806-1883), working in Bennettsville, Marlboro, SC circa 1830-70. However, I think it possible due to the style of this piece that this is the work and mark of Asa Peabody, working circa 1815-20 in New York and after 1820 in Wilmington, North Carolina. The other possibility is that this would be a second mark for John Tyng Peabody (working from 1787-1822 in Wilmington, NC), whose known mark is a similarly primitive J+PEABODY in a rectangular punch. 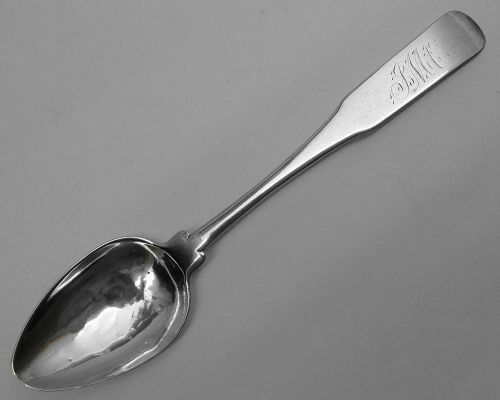 In any event, a rare and early Southern coin silver spoon! This piece is engraved with a period script monogram, which may be "SMC". It measures about 5 3/8 inches in length and weighs about 12 grams. Condition overall is fair, with some surface wear and some wear and dimpling to the bowl, but no splits or repairs. All in all a fine and rare piece of early North Carolina or South Carolina silver!